The Journal of Gene Medicine clinical trial site presenting charts and tables showing the number of approved, ongoing or completed clinical trials worldwide. Data is available for: Continents and countries where trials are being performed; Indications addressed; Vectors used; Gene types transferred; Phases of clinical trials; Number of trial approved/initiated 1989-2007. A searchable database is also present with detailed information on individual trials. The data are compiled and are regularly updated from official agency sources (RAC, GTAC etc..), the published literature, presentations at conferences and from information kindly provided by investigators or trial sponsors themselves. Beware that information on some trials is incomplete as some countries regulatory agencies simply do not disclose any information. See also: Gene therapy clinical trials worldwide to 2012 - an update. J. Gene Med. 2013 Feb;15(2):65-77. >> Overview of gene therapy trials recently received in the last 30 days. The ISRCTN Register is a register containing a basic set of data items on clinical trials that have been assigned an ISRCTN. Records are never removed from the ISRCTN Register (except in cases of duplications), which ensures that basic information about trials registered with an ISRCTN will always be available. The ISRCTN Register complies with requirements set out by the World Health Organization (WHO) International Clinical Trials Registry Platform (ICTRP) and the International Committee of Medical Journal Editors (ICMJE) guidelines, and complies with the WHO 20-item Trial Registration Data Set. The database is maintained by Clinigene. The aim of this website is to provide a complete database of all published clinical gene therapy trials carried out worldwide. At this point in time the database is nearing completion and is open to the public. 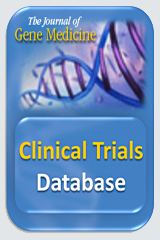 The database includes most clinical trials sponsored by NCI. The registry contains more than 5,000 abstracts of clinical trial protocols that are open/active and approved for patient accrual (accepting patients), including trials for cancer treatment, genetics, diagnosis, supportive care, screening, and prevention. In addition, the registry contains more than 16,000 abstracts of clinical trial protocols that have been completed or are closed to patient accrual. The EU Clinical Trials Register website allows you to search for information on clinical trials in European Union (EU) member states and the European Economic Area (EEA) and clinical trials which are conducted outside the EU/EEA if they form part of a paediatric investigation plan. The information on the website is collected and entered by national medicine regulatory authorities or by the addressee of a PIP decision for trials conducted outside the European Union. They are required by European Union law to enter details of clinical trials into a database called EudraCT. The information stored in this database is now being made publicly available through a new website, the EU Clinical Trials Register. Information on the website dates from May 2004. The site is managed by the Joint Research Centre of the European Commission on behalf of the Directorate General for the Environment. The purpose of the site is to manage all the information flow to and from the public regarding deliberate field trials under EU Directive 2001/18/EC, including gene therapy. Be aware that in some EU member states gene therapy trials fall under the EU contained use directive and are not listed in this database. The SBB maintains a database of all the genetically modified micro-organisms (GMM) that have been notified in Belgium for clinical trials. The following information is available, when relevant, for notifications that include a deliberate release (so not those notifications that are labled as "contained use only": Description of the deliberate release, Information related to the decision procedure, The "Summary Notification Information Format" (SNIF), Public information written by the notifier, and Relevant guidelines. Database on clinical gene therapy trials is available only in French (restricted access). Information on clinical trials in the Netherlands. The Trail Register is part of the Dutch Cochrane Centre. Information on clinical gene therapy protocols is available from this governmental site which provides information only in Dutch. See also: Gene therapy in The Netherlands: highlights from the Low Countries. J. Gene Med. 2007 Oct;9(10):895-903. The ANZCTR is an online register of clinical trials being undertaken in Australia and New Zealand. The ANZCTR includes trials from the full spectrum of therapeutic areas trials of pharmaceuticals, surgical procedures, preventive measures, lifestyle, devices, treatment and rehabilitation strategies and complementary therapies. It has coverage all clinical trials involving Australian/New Zealand researchers or participants. Trials that do not involve Australian/New Zealand researchers or participants will be accepted if there is not a more appropriate national registry with which they should be lodged.